This weekend was a busy one with parties and get togethers. With just a couple of days left to go for the most awaited sporting event, FIFA world cup 2014, the mood and flavor of all parties had to be football. The conversations had to be seasoned with football banter. I am sure you all must be experiencing this. Cook the meat with the beans and spices till tender and dry. Add the herbs and dry grind.You can add half a teaspoon of Allspice powder or garam masala powder if you wish. Leave in a fridge for half an hour. Make balls and deep fry. .
Now let’s get started with the rice. I use Basmati rice because it is Aromatic and Flavorful. Soak 4 cups rice for half an hour. Boil 2 liters of water to which you have added 2 tsps. salt, 3 cloves, 3 cardamom, 3 inch cinnamon stick,a tablespoon of oil, some fresh coriander and mint. Put the rice and cook till just done. Take a pot and spread a tablespoon of oil. Cover and cook for five minutes on low heat. 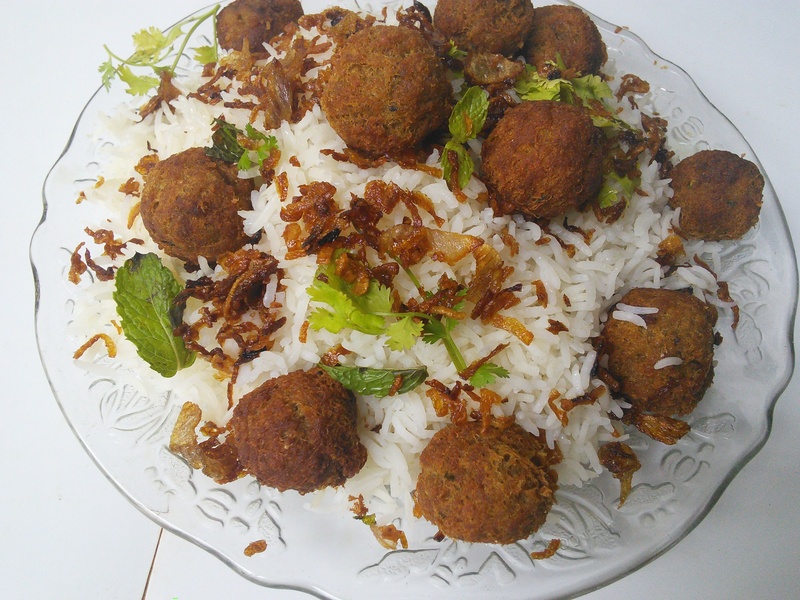 Serve on a platter garnished with crisp fried onion, fresh herbs and the Meat balls. I love that you made the meatballs out of lamb!!! Yummy!!! Really a nice recipe. The meatballs with lamb and the beans is a great idea, have never tried that before and the fragrant rice with those meatballs is wonderful. I have tried meatballs using lamb meat before because I thought it was beef. I did not even look at the label. And it’s not that bad. It has stronger taste than beef, but it’s good. So I know that these meatballs taste good. 🙂 Thanks for sharing! Have a lovely week! What a great recipe, I’ll def be trying it out. Looks soooooo yummy. Thanks for dropping by my blog! Be still my heart—look at those meatballs!! !